The 10 Days Uganda Gorilla Safari, Uganda Wildlife Tour, Chimpanzee Tour Uganda. The 10 Days Uganda Gorilla tour, wildlife & Chimpanzee tracking safari is one of the best Uganda safari taking you to Uganda’s major protected areas. The safari stars in Kampala and ends in Kampala covering Ziwa Rhino Sanctuary, Murchison Falls Park, Kibale Forest Park, Queen Elizabeth Park, Bwindi Impenetrable Park and Lake Mburo National Park. The safari stars in Kampala and ends in Kampala. The tour covers Ziwa Rhino Sanctuary – the home of white Rhinos in Uganda, the Murchison Falls National Park – the home of the world’s powerful waterfall, Kibale National Park – the home of habituated chimpanzees and other 12 species of primates, Queen Elizabeth National Park – the home of tree climbing lions, Bwindi Impenetrable National Park – the home of the critically endangered mountain gorillas and Lake Mburo National Park – the home of Impala antelope. It brings in a taste of wild game, primates and recreation. After your early morning breakfast in your Kampala/Entebbe Lodge, the driver guide will pick-up and embark on the 5hours drive on the north western side of Uganda to Murchison Falls National Park. The drive from Kampala will take you through the flat landscapes of Nakasongora with savannah vegetation dotted with long horned Ankole cows. After covering distance of 115km from Kampala in Nakitoma, you branch from the mainly route and drive 7 km to Ziwa Rhino Sanctuary. While at the Sanctuary, you will explore the only white Rhinos protected in this park of Uganda .You will also have your wonderful Lunch at Kabalega dinner and thereafter proceed with the drive to Murchison Falls National park where you will visit the top of the falls upon arrival to encounter the Nile River passing through an 8m ravine forming a thunderous roar and a plume of spray marked with a trade mark rain bow as it falls 43m below to what has been termed as the Devil’s Cauldron. Retire to the lodge for relaxation, dinner and overnight. Paraa Safari Lodge (Upmarket/Luxury), Pakuba Safari Lodge (Mid-range/Standard) or Heritage Safari Lodge (Budget/Basic). After an early morning hefty breakfast, embark on the drive through the park in search of the elusive wild game. The rolling savanna combretum of Murchison Falls National Park supports a range of wild game including the elephants, giraffes, buffaloes, water buck, Jackson hartebeest, oribis, lions, leopards among others The early morning drive through the well-arranged driving tracks of the delta area, Buligi tracks, Albert and Queen tracks provides thrilling opportunity for you to enjoy the views of elusive wild game. After rewarding drive of 3 – 4 hours, you will retreat back to the lodge for relaxation, lunch while waiting for an afternoon boat cruise. After lunch and having rest, you drive to Paraa to link-up with the afternoon Lunch Cruise that sets of at 2:30pm and takes 3-4 hours of adventure. Taking boat cruise to the bottom of the Nile will not only reward you with the encounters of the wild game when they are drinking on the river side, but it also takes you to an area where you can have clear glimpse of wildlife species like Hippos, Nile Crocodiles and a range of water birds such as the endangered species of the Shoebill Stork. Retreat from the activity for relaxation, dinner and overnight. Accommodation: Ndali Lodge (Upmarket/Luxury), Chimpanzee Forest Guesthouse (Mid-range/Standard) or Rwenzori View Guesthouse (Budget/Basic). After early morning breakfast, embark on the memorable Chimpanzee trekking encounter in the natural habitat of primate Capital of the world – the Kibale Forest National Park. The Park is proud of 13 primate species including the world endangered species of the Chimpanzees which have been fully habituated increasing the chance of encountering them to 90%. The Chimp trekking safari in Uganda`s the primates Capital starts at Kanyanchu tourism center at 8:00am local time in the morning and the experienced Uganda Wildlife Authority Park rangers are dedicated to lead you throughout the whole rewarding processes of trekking the Chimps in their natural Habitat. The trek exposes you to stunning flora, other primate species including black and white colobus monkey and birds before meeting face to face with the chimps. The Chimpanzees will lure you in a state of amazement as they swing through the branches, make pant hooting calls, play with each other, and imitate your body language along with other features that will make your one full hour with them a memorable experience of its own. Retreat from the activity which tends to take 2 – 5 hours to embark on the transfer to Queen Elizabeth National Park 157km from Kibale about 3 hours’ drive arriving in the evening at the lodge for relaxation dinner and overnight. Mweya Safari Lodge (Upmarket/Luxury), Enganzi Game Lodge (Mid-range/Standard) or Pumba Safari Cottages (Budget/Basic). Wake up early in the morning like at 6:00am, take your breakfast and embark on the wild game drive at 6:30am in the rolling savannah plains of Queen Elizabeth National Park. The drive will take you through Kasenyi with the opportunities of meeting the nocturnal wildlife species when they are retreating back to their hiding grounds and also meet the early morning risers when they are starting their daily activities of looking for food. The ranges of wild game which may be seen during the game drive include the elusive leopard, defassa waterbuck, Uganda kob, Side stripped Jackal; Oribis elephants, lions, buffaloes, Antelopes among others. The tracks are well designed to increase you possibilities of encountering wild game in their natural habitat of Queen Elizabeth National Park. Retreat from the activity and return to the lodge for relaxation and lunch after which you will transfer to Mweya for a thrilling boat cruise on the 45km long Kazinga Channel with the impressive views of aquatic wildlife like Nile Crocodiles, Hippos, birds and a range of other wild game like elephants, buffaloes & antelopes drinking on the channel side. The boat takes 2 hours and stretches to the shores of Lake Edward overlooking the Congo boarder. Retreat from the activity, do a game drive along the channel track and extend a little to the savannah plains of Kasenyi as time may allow before heading to the lodge for dinner and overnight. After your early morning hefty breakfast, your driver guide will drive you with your packed lunch, bottled water, to the Park head Quarters in your respective gorilla trekking region for an early morning briefing at about 70:30am to 8:00am about etiquettes of gorilla trekking in Bwindi Impenetrable Forest. While at the park headquarters, you will meet other trekkers and you will be divided into groups of eight individuals who are only allowed to trek one specific habituated Gorilla family. After briefing, UWA experienced ranger guide will lead you to the trail heads where thrilling gorilla trekking experience starts from. You will entre in the ancient, thick dark impenetrable forest to begin hiking the hills and slopping the valleys when looking for the unique species of the mountain gorillas inhabited in the famous Bwindi Impenetrable Forest. The trek can take you between 2-8 hours to meet face to face with the mountain gorillas and once up close, you will be allowed to spend one magical hour with these stunning apes. During this time you can decide to sit down listen to gorilla crumble, study how these apes go about their daily activities and you can take as many photos as possible. When the one hour is done, you will walk back to the park headquarters and embark on the transfer to Lake Bunyonyi via the fascinating Kigezi Highlands for relaxation, dinner and overnight. After breakfast, embark on the sunrise boat cruise on the Lake of a thousand Islands – Lake Bunyonyi amidst the scenic hills of Kigezi. The thrilling boat encounter with expose you to the main Islands, giving you a time allowance to do walk on the Islands exploring the life of the people that have lived there for years including Batwa people who are very short than an average person along with their impressive tradition. The activity takes about 5 hours after which you have to embark on the transfer to Lake Mburo National Park 199km about 4-5 hours’ drive arriving in the evening for relaxation, dinner and overnight. Mihingo Safari Lodge (Upmarket/Luxury), Arcadia Cottages Mburo (Midrange/Standard) or Eagles Nest (Budget/Basic). After breakfast, embark on a morning game walking safari in Uganda`s the Savannah landscapes of Lake Mburo National Park. The acacia landscapes are dotted with a range of wild game including the Impala, Burchell’s Zebra, Topis, elands, buffaloes, water bucks among others. The scenery is also impressing. Retreat from the activity to embark on the transfer to Kampala 240km about 3 – 4 hours’ drive. 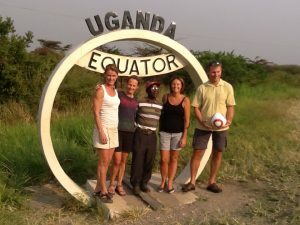 You will make a stop at Uganda Equator crossing Kayabwe for amazing photo shoots and water experiments.